Editor’s note: Pro photographer Paul Bride is based in Squamish in the British Columbia province of Canada, but his photographic adventures span six continents. With a background in travel and adventure, Paul has provided imagery for many of the top North American outdoor companies, including Arc’teryx, Patagonia and Black Diamond. He is one of the Red Bull Illume Top 50 Best Sports Photographers, a first-prize winner in the Vancouver International Mountain Festival Photography Competition, and won the Best Short Film category in the Banff Film Festival in 2007. Paul used a Pro Trekker 400 AW on recent assignments and shares his impressions of the design here. “Over the past three months I have been on separate assignments in five countries and flown around the world on 16 flights. When out of the office for long periods, it’s of vital importance that I can get clients back home what they need while still focusing on the photo assignment at hand. 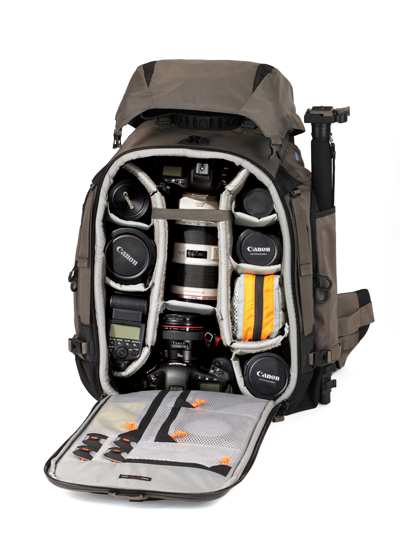 The Pro Trekker 400 AW allows me to travel with two pro DSLR bodies, four lenses, flash, external drive, and a laptop computer. This allows me to set up an office in any space globally, never missing a sale, or for a quick edit while waiting for the next flight. A very nice design feature of this pack is that it can be carried on both large and small commercial flights. It fits comfortably under the seat in front of you on smaller flights and easily in the overhead bin on larger planes. This pack allows you to safely transport an assortment of essential equipment while not leaving specialty items at home you may not of had room for in the past. With sealed zippers and a rain cover I never had to worry about my equipment getting ruined. 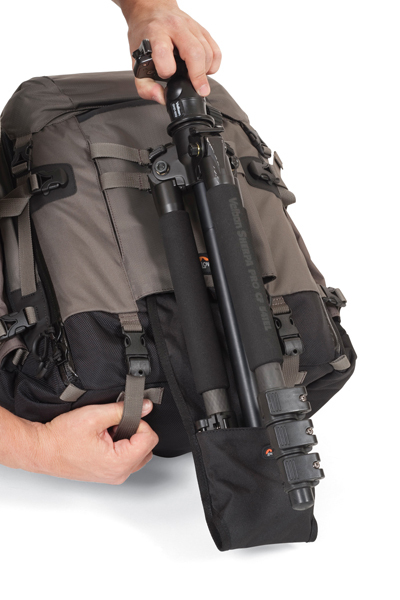 The external pack allows for easy carrying of a professional tripod and for long approaches or a day in the field the pack has a built-in hydration system.